What is on your driving licence? This is your surname, as recorded on the driver's record. These are your first names, as recorded on the driver's record. These are the details recorded on the driver's record. The date shown in 4a is the date the photocard was issued. 4b shows the date the photocard must be renewed. 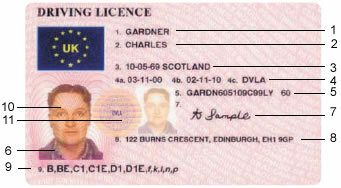 The authority that issued the licence is shown in 4c. In Great Britain that is the DVLA. B = The first and last numbers are the year of your birth. The second and third numbers are the month of your birth. (If you are female, '5' is added to the second number and the total used as the second digit. So if you are a woman born in October the second and third numbers would be 60.) The fourth and fifth digits are the day of the month you were born on. C = This is the first two initials of your first names. If you have only one inital, the second character will be a '9'. D = Computer check digits, randomly produced as a security measure. E = This is the licence issue number, which will increase by one with every licence issued. This number should correspond with the number on the upper right of the paper part of the licence. This is a digital copy of the photo you provided with your application. This is a digital copy of your signature on the application form. This shows your permanent address in Great Britain. The letters in capitals show the categories of vehicle you can drive according to the European Community Directive. The smaller letter show the national categories of vehicles you can drive. This is the stamp of the authority that issued the licence. This image of the holder's photograph is a security feature. It prevents the licence from being copied. The bar code links a photocard with its counterpart document. These pictures show the types of vehicle in the categories shown. These are the dates when your entitlement to drive each category of vehicle begins and ends. 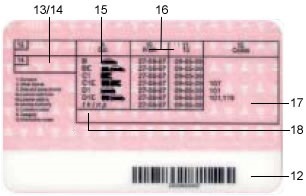 The code numbers printed in this area show any restrictions to your driving the category of vehicles shown. This is a list of the categories of vehicle you are entitled to drive. Provisional entitlements are listed on the paper part of the driving licence. These are the licence categories and what they mean. Rigid motor vehicle not exceeding 3500kg. Rigid motor vehicle exceeding 3500kg but not 7500kg. Rigid motor vehicle exceeding 7500kg. Category B vehicle towing a trailer. Category C1 vehicle towing a trailer with a maximum combination of 12000kg. Category C vehicle towing a trailer. This covers both rigid/drawbar combinations and articulated vehicles exceeding 7500kg. Minibus towing a trailer over 750kg. Bus or coach with more than eight passenger seats towing a trailer over 750kg. If you hold a B, C1 or C licence, you are eligible to tow a trailer without the need for the extra +E entitlement, however there are restrictions. Category B can pull a trailer with a MAM of 750kg and a total of 4250kg combined weight (vehicle + trailer). Category C1 can pull a trailer with a MAM of 750kg, and a total weight of 8250kg. Category C can pull a trailer with a MAM of 750kg. In each case, if the MAM of the trailer exceeds 750kg, then an additional +E test will be required. 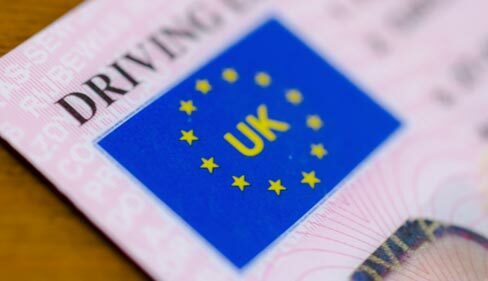 Drivers who passed their Category B test before 1 January 1997 were granted the additional C1 and C1+E entitlement automatically when they were 18 years old. These drivers, with the C1+E entitlement, are restricted to vehicles with a MAM not exceeding 8250kg. New drivers (after January 1997) are required to pass the C1 test if they wish to add this entitlement.